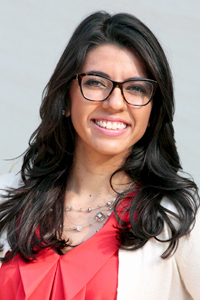 Dr. López received her Ph.D. in Cognitive Psychology from Texas A&M University in 2015. Afterwards she was awarded the Carlos E. Castañeda Postdoctoral Fellowship at the Center for Mexican American Studies at The University of Texas from 2015-2016. Currently, she is an assistant professor in the department of Mexican American and Latina/o Studies and an affiliate in the Center for Mexican American Studies and the department of psychology. Dr. López is also the director of the LLAMA: Psycholinguistic and Sociolinguistic Laboratory. Dr. López's research program focuses on bilingualism; particularly on how knowing and using multiple languages can shape cognition in terms of creativity, problem solving, decision-making, and language access. While studying Spanish-English bilinguals in the United States, especially Latina/os in the southwestern United States, she observed that bilinguals are not homogeneous. For this reason, Dr. López became interested in observing individual differences within bilinguals. She examines how early linguistic and cultural experiences (e.g., informal translation) have long-term cognitive and linguistic outcomes. She is committed to expanding the current psycholinguistic literature on bilingualism to include more individual differences in the areas of creativity, code-switching, cross-language activation, decision-making, and problem solving. Dr. López’s goals is to conduct research that better understands how early language experiences, particularly in Latinx communities, can affect the way language is processed, stored, and retrieved, while understanding how language use also affects cognition. Other interests include: humor, semantics, figurative language, creativity, and Latinx psychology. The purpose of this course is to examine the psychological research and literature related to the experiences of Latinxs in the U.S. through readings, media, and class discussions. The course will provide an introduction to the various Latino subgroups and the course will provide with an introduction and general background to Latina/o psychology. Acquire knowledge regarding historical, cultural, economic, and political factors that explain the experiences and value orientations of Latina/os in the U.S. Engage in Latina/o self-expression and knowledge in various mediums (i.e. culture, religious practices, literature, poetry, language practices etc.) in order to gain cultural competence to advance one’s knowledge and understanding of between and within group difference among Latina/os. Examine how Latina/os have been positioned within local and national communities, cultural systems, and discourse using in class discussion and readings. Arrive at understanding of how Latina/o psychology is both theoretically and intellectually important in relation to the Latina/o experience in the U.S.
Hurtado, A., & Gurin, P. (2004). Chicana/o Identity in a Changing US Society: ¿Quién Soy? ¿Quiénes Somos?. University of Arizona Press. Villarruel, F. (2009). Handbook of US Latino psychology: Developmental and community-based perspectives. Sage. Attendance is highly recommended and will be taken into account. 1.) Participation and attendance (15%): This course will be dependent on your active participation and in class discussion. This includes having completed the class readings before coming to class and by bringing questions and comments you have about each reading. 2.) Reflection papers (20%): At the end of each class unit you will be required to turn in a reflection paper. In this paper you will give your reflections in the form of comments, critiques, questions, etc. raised from that unit’s readings. Page length requirement is 1 page single spaced due at the beginning of each class. 3.) In-class presentation (25 %): Each student will be selected to lead the discussion of the readings given on a particular day. This student will be in charge of briefly summarizing the content of the readings and posing questions or raising critical issues to the class for discussion. Your thoughts and perspectives on the assigned texts will fuel that day’s in-class discussion. 4.) Film Analysis (FA) (25%): You will pick one of the film from the list of films provided in class and will write a paper in which you synthesize and analyze your observations of relevant class issues in the film. Provide implications of your observations and relate issues to course readings, discussion, etc. 5.) Final Paper (15%): You will be required to develop a research paper that explores in-depth one or more topics related to the Chicana/o experience (i.e. race, gender, culture, acculturation, immigration, spirituality, etc.). You may also raise questions and ideas as well as any reflections stemming from class discussion, readings, and films. Required length is 12-15 pages not including sources/references. A bilingual is defined as an individual who functions in more than one language on a regular basis. Psycholinguistics is the study of the cognitive processes that underlie how language users acquire, comprehend, produce, use, and represent language. This course will provide an introduction to classic and recent work on bilingualism from a psycholinguistic perspective. After reviewing basic concepts and methods in psycholinguistics the course will address empirical studies and theoretical frameworks related to such topics as stages of bilingual language acquisition and the role of age of acquisition, how bilinguals perceive and segment speech sounds, how word meanings are accessed and stored, how sentences are understood and planned, how characteristics of written language affect reading, how mixed language utterances are processed, and how properties of specific languages shape thought. Additional topics will include cognitive and neural repercussions of knowing more than one language, the cognitive impact of differences in degree of informal translation experience, and how bilingual language processing may be affected by aging, disuse of a language, or brain-injury. Given the interdisciplinary nature of the topic we will draw on research from cognitive psychology, linguistics, computer science, education, and neuroscience. Students will have the opportunity to apply course concepts by making their own bilingualism related internet memes. De Groot, A. M. (2011). Language and cognition in bilinguals and multilinguals: An introduction. Psychology Press, New York, NY. Bialystok, E. (2009). Bilingualism: The good, the bad, and the indifferent. Bilingualism: Language and Cognition, 12, 3-11. Clashen, H., & Felser, C. (2006). How native-like is non-native language processing? Trends in Cognitive Sciences, 10, 564-570. Comeau, L., Genesee, F., & Lapaquette, L. (2003). The modeling hypothesis and child bilingual codemixing. International Journal of Bilingualism, 7(2), 113-126. Cook, V. (1991). The poverty of the stimulus argument and multicompetence. Second Language Research, 7, 103-117. Grosjean, F. (1997). The bilingual individual. International Journal of Research and Practice in Interpreting 2, 163-187. Haugen, E. (1986). Bilinguals have more fun! Journal of English Linguistics, 19, 106-120. Heredia, R. R. & Altarriba, J.(2001). Bilingual language mixing: Why do bilinguals code- switch? Current Directions in Psychological Science, 10, 164-168. Hilchey, M.D. & Klein, R.M. (2011). Are there bilingual advantages on nonlinguistic interference tasks? Implications for plasticity of executive control processes. Psychonomic Bulletin & Review 18, 625-658. Ianco-Worral, A.D. (1972). Bilingualism and cognitive development. Child Development, 43, 1390-1400. Moreno, E.M., Rodríguez-Fornells, A., & Laine, M. (2008). Event-related potentials (ERPs) in the study of bilingual language processing, Journal of Neurolinguistics, 21, 477-508. Peal, E. & Lambert, W.E. (1962). “The relation of bilingualism to intelligence,” Psychological Monographs: General and Applied, 76 (27), 1-23. Poplack, S. (1980). Sometimes I’ll start a sentence in Spanish y termino en español: Toward a typology of code-switching. Linguistics, 18, 581-618. Vaid, J. (2006). Joking across languages; Perspectives on humor, emotion, and bilingualism. In A. Pavlenko (ed.) Bilingual minds; Emotional experience, expression, and representation (pp. 152-182). Clevedon: Multilingual Matters. This course will consist of lectures, discussion, as well as in-class discussion of readings led by students. Participation and attendance (10%): This course will be dependent on active student participation and in class discussion. This includes having completed the class readings before coming to class and bringing questions and comments about each reading. Reflection papers (40%): Each week students will be asked to turn in a 1-page reflection paper that is in the form of comments, critiques, or questions, based on the readings for that particular week. Leading discussion (20%): Each student will lead discussion of one of the readings given on a particular day. This will involve briefly summarizing the content of the readings and posing questions or raising critical issues to the class for discussion. Student thoughts and perspectives on the assigned texts will fuel that day’s in-class discussion. Bilingualism Internet Meme (15%): Students will be asked to form small groups and each group will create an internet meme based on a topic covered in class. The groups will also submit a written statement on how that meme is related to class. The groups will compete with each other to come up with the best memes. Grades will be based on completion and participation. Final Paper (15%): Students will prepare a research proposal on a topic relevant to the course. The proposal will identify a research question, briefly review relevant literature, and propose a way of answering the question. Required length is 8-10 pages not including sources/references.